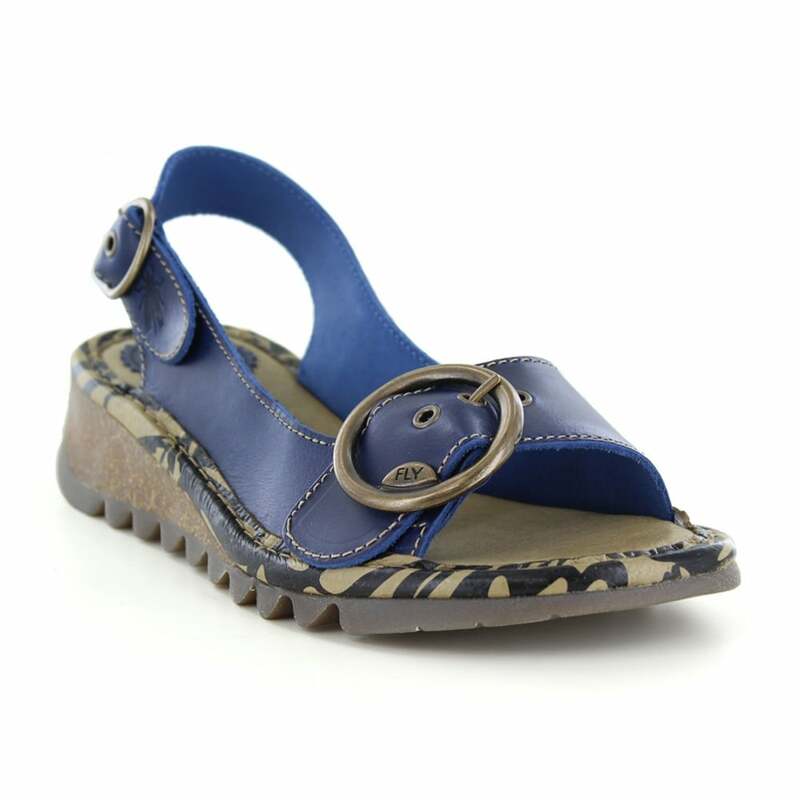 Fly London are back in a big way for the Spring Summer season with lovely collection of high quality womens sandals including this Tram style, finished here in a beautiful blue. The Tram sandal is a slip on, peep toe, sling back style sandal with a gentle wedge shaped sole rising to just 5cm / 2 inches at the heel. The upper is made from a luxuriously soft genuine leather in blue. Featuring a single wide adjustable strap with large brass O ring buckle, these Tram sandals can be tightened or loosened through three settings for the perfect fit. The footbed is finished in a dark taupe coloured soft leather over a soft cushioning layer of shock absorbing material. The same soft leather also lines the underside of the leather upper, adding to their comfort. The midsole is a cork effect composite rubber resin with shavings of light coloured material embedded throughout. The sole unit is finished with a rubber, deep cleated tread offering supreme grip. Exceedingly comfortable to wear and easy on the eye, the Fly London Tram sandals will make an excellent choice for your Summer wardrobe so get yours today.